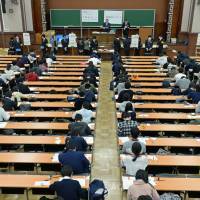 The Japan Association of National Universities (JANU) has adopted its new English proficiency benchmarks for entry into state-run universities, which now measure English speaking and writing skills, giving high school students a better grasp of the language before entering college. The new standard approved by JANU on Tuesday, stipulates that scores on private-sector English tests that assess across-the-board English skills, such as the TOEFL (Test of English as a Foreign Language), should ideally account for at least 20 percent of the English proficiency assessments used for university admission. 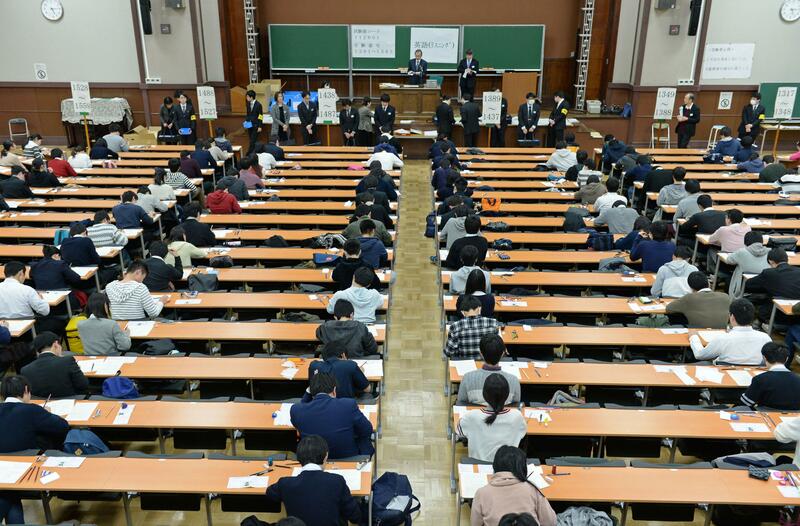 The benchmark, which will be introduced in January 2021, is not binding, meaning the degree to which private-sector test results are incorporated may vary among universities, association members said at JANU’s general assembly held Tuesday in Tokyo’s Chiyoda Ward. The existing unified English exam, called the National Center Test for University Admission, uses computer-read answer sheets and mainly measures reading and listening skills. Under the 2020 university admission reforms, the entrance exam will be renamed the Common Test for University Admission, and those hoping to enter universities will be required to also take private-sector English tests that assess speaking, writing, listening and reading levels. The association adopted its policy last November on assessing English proficiency with both the Common Test and private-sector tests between the 2020 and 2023 academic years. From 2024 onward, only private-sector test results will be used. “We place importance on the holistic evaluation of four different English skills … however, on the other hand, high schools have expressed concern that a high ratio (in test scores) focused on those four skills would be troublesome,” said Masaaki Oka, president of Yamaguchi University and vice president of JANU, at a news conference following the general assembly. “We believe that 20 percent is an appropriate weight for helping students (to focus on the four different skills) to some extent, and we can always increase the level in the future,” he added. Amid various entrance exam reforms proposed by the Education Ministry, the weight of private-sector English tests has been a major topic of discussion because too high a weighting could be seen as unfair to students from lower-income households. Prices for the eight accredited private-English tests range from about ¥7,000 for the Global Test of English Communication to around $235 (¥26,000) for the TOEFL. Six other English tests are available, including the Cambridge Assessment English and Eiken. High school students in their third year and other university hopefuls can choose to take any of the permitted English tests up to two times between April and December. Their scores will then be standardized by the Common European Framework of Reference for Languages (CEFR), which categorizes the results into six different levels. Those private-sector English test results will also be used as a qualification benchmark for applicants to universities. For example, JANU said that students who scored at least A2 — the second lowest English proficiency level given by CEFR — should be eligible to apply for national universities. Juichi Yamagiwa, president of Kyoto University and JANU, said he hopes that introducing assessments of the four different skills will contribute to the raising of English education levels in high schools. “(University standards) are not unrelated to high school education levels, so it is necessary to pursue (admission) reforms for their improvement,” he said.